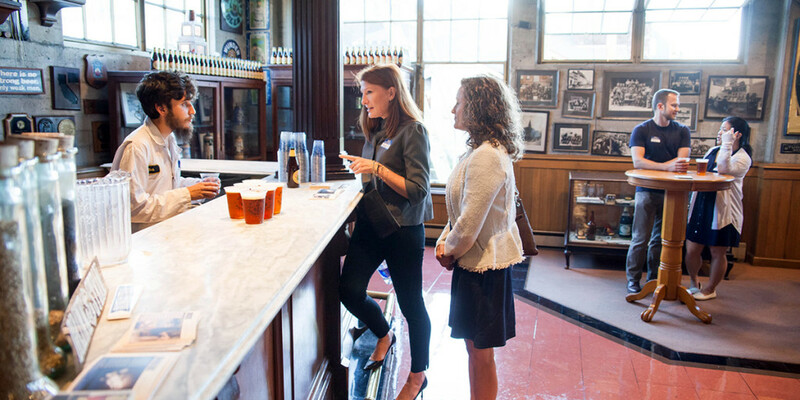 The Anchor Brewing tour is a fun, educational, and beer-filled experience enjoyed by San Francisco locals and tourists alike. The tours include a visit to the brewhouse, the fermentation rooms, the conditioning cellars, and the bottling shop with explanations of the various steps in the brewing process. And, for everyone’s favorite part, the tours conclude with an extensive beer tasting in the Anchor Taproom. We highly encourage anyone visiting or living in San Francisco to visit. 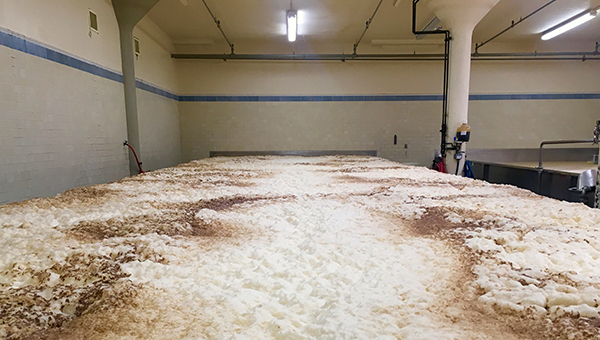 However, for those of you who aren’t able to make it to our San Francisco brewery, here’s an insider’s view of the Anchor Brewing Tour. Welcome to Anchor Brewing Company. 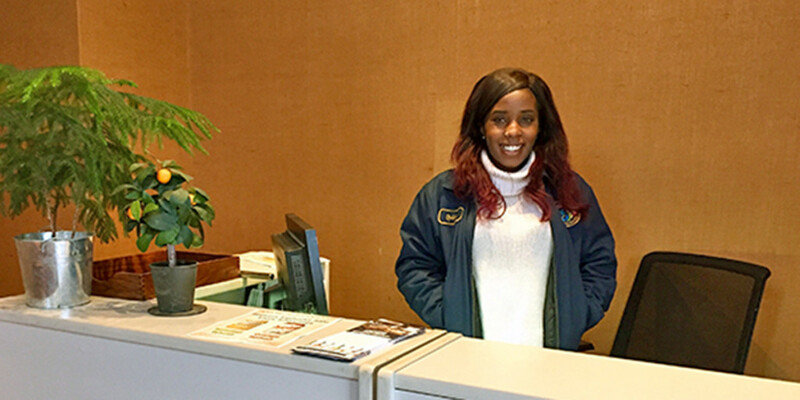 When you arrive for your brewery tour you’ll be greeted by our reception team who will answer your brewery questions and check you in for your scheduled tour. Situated directly next to the Anchor brewhouse, our quaint taproom is the starting and ending point for our tours. Decked out with a myriad of relics from our country’s brewing past, you’ll find this cozy bar to be your home for the majority of the tour. 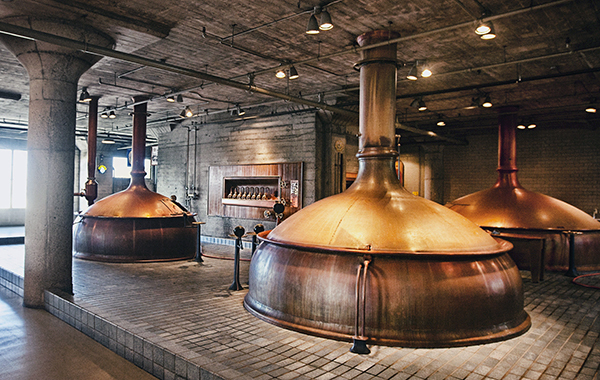 Just outside the taproom is our brewhouse which boasts three handsome, all-copper kettles. Milled malts and water are introduced to the mash tun (left kettle) and, when ready, transferred to the lauter tun (back kettle) where the wort is drawn from the grain. The wort is then run through the Grant (brewhouse wall) and finally transferred to the brew kettle (center kettle) where we introduce whole-cone hops to bitter and balance the brew. Porter Pondering Point: Our kettles were built in Germany in 1956 and have a 125 barrel (~41,000 beers) capacity per brew. Once the boil is completed in the brew kettle, the hopped-wort is then sent down the hall and cooled. Once we reach the appropriate temperature the finished wort is transferred to our open fermenters, yeast is added, and fermentation begins. The beer will undergo an open primary fermentation for 2-3 days, depending on the beer, before being sent to finish fermentation in the cellar. Liberty Lesson: Ale yeast ferments on top of the beer and prefers warmer conditions while lager yeast appreciates colder conditions and ferment on the bottom of the liquid. Anchor Steam Beer is a unique ‘hybrid’ which uses lager yeast but ferments in warmer temperatures. Further down the hallway is the mandatory must-smell hop room. Our brewhouse makes use of hops in their unprocessed, whole-cone form. While hops were historically used to preserve the beer they are also heralded for their ability to balance, bitter, and add a bouquet to beer. Old Foghorn Factoid: The now-common Cascade hop, known for its piney aromas, was first commercially used in the U.S. in 1975 when Anchor Brewing created Liberty Ale. After primary fermentation the beer is then transferred downstairs to the cellar. 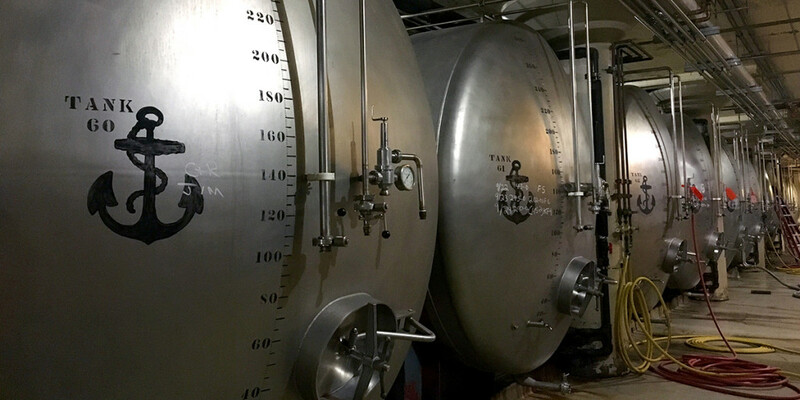 The beer will finish fermentation in these large, horizontal fermenters for roughly 2-3 weeks for ales and 4-6 weeks for lagers. If we want extra hop aroma we will dry-hop in these tanks by adding mesh sacks of hops, amplifying the dynamic hop bouquet. The cellar is located 12 feet below street level, and all of our cellar tanks (78 total) can hold a total of 10,000 barrels. 1 barrel of beer comes to 330 twelve oz. bottles, so at any given time we can be sitting on top of 3,300,000 twelve oz. bottles of Anchor beers! 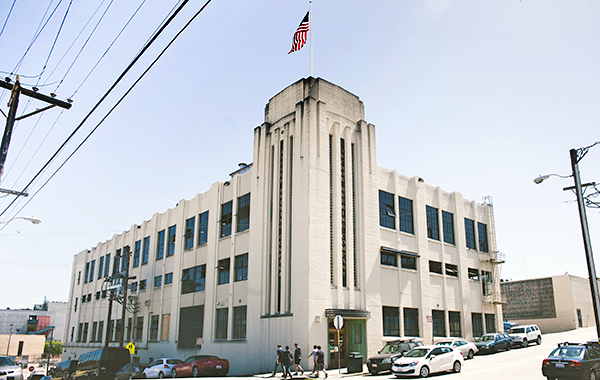 Our Special Hail: While we’ve hailed from San Francisco since 1896, Anchor began brewing at its current building, a former coffee roasting plant, in 1979. Once the beer is done fermenting in the cellar it is then sent to our filtering room. Here we will filter the beer and then flash pasteurize it to ensure it stays fresh on its voyage to numerous countries, any of the 50 states, or better yet . . . our taproom! Summer Wheat Feat: Our filtration system works at 50 gallons per minute! Heading up from the cellar you can’t help but notice the humming of our bottling line. While bottling is the majority of our output we also can and keg beer onsite. Our petite canning line fills about 60 cans per minute while our bottling line moves at a pace of 420 bottles per minute. Brekle’s Blurb: While not seen on the tour, we have a second bottling line deeper in the warehouse. This secondary line fills 12oz. plastic bottles, 22oz. bottles, and 1.5L magnums. It is also used to bottle Anchor Distilling’s gin and whiskey. Now that you’ve seen our unique way of making beers it’s time to try them out. The tour concludes with a tasting a variety of our beers in the taproom and an open forum for questions and chatting with our staff. After your walk around the brewery, fresh beer has never tasted so good! Anchor’s Final Quip: Notice any bad puns leading into Anchor facts? They all actually correspond to beers we make in chronological order. Visit https://www.anchorbrewing.com/ and click “Beer” to learn more about these beers, and why they are important to this craft beer revolution! Parting is such sweet sorrow but why let that bring your down? 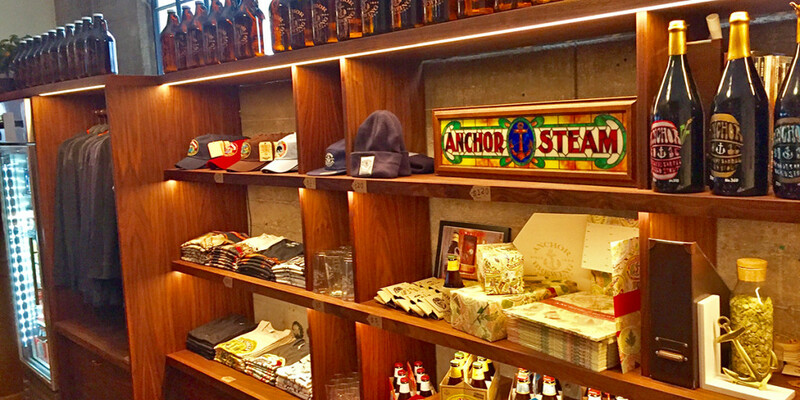 Feel free to stop by the Anchor Brewing Store for glassware, merchandise, and other goodies. You can even pick up packaged beer or growlers to go! The Anchor Shop is open to the public every day 11am-7pm. Not in San Francisco? View some of our merchandise in the online store. We offer tours 7 days a week, Monday-Thursday at 11am & 1:30pm and Friday-Sunday 11am, 1:30pm & 4pm. To learn more about brewery tour availability and to make a reservation, click here. Please note that due to popularity of our tours, making reservations in advance is required. Not in San Francisco? Use our Anchor Beer Finder to find a brew near you! Follow us on Facebook, Twitter, and Instagram and use #RaiseYourAnchor to stay connected! We would like to have a tour of your brewery. Is it possible during the weekend?